Online Teaching at Its Best: A Merger of Instructional Design with Teaching and Learning Research is the scholarly resource for online learning that faculty, instructional designers, and administrators have long been awaiting. Over 70 percent of degree-granting institutions offer online classes, and while technical resources abound, the courses often fall short of integrating the best practices in online pedagogy, even if they comply with online course design standards. Typically these standards omit the best practices in teaching and learning and the principles from cognitive science, leaving students struggling to keep the pace, understand the material, and fulfill their true potential as learners. This book fills the gap, providing evidence-based practices for online teaching, online course design, and online student motivation integrated with pedagogical and cognitive science to help you build the distance learning courses and programs your students deserve. As more and more students opt for distance learning, it's up to designers and instructors to rethink traditional methods and learn to work more effectively within the online learning environment, and up to administrators to provide the needed leadership. Online Teaching at Its Best provides practical, real-world advice grounded in educational science to help online instructors, instructional designers, and administrators deliver an exceptional learning experience. Distance is no barrier to a great education; what do stand in the way are inadequate online course design and implementation and deficient faculty training and support—all of which administrators can mitigate. Online Teaching at Its Best will help you ensure that your online classes measure up to the rigor and quality of excellence in teaching and assessment, build in the personal touch for developing a learning community and equip your students to succeed in the next challenge. 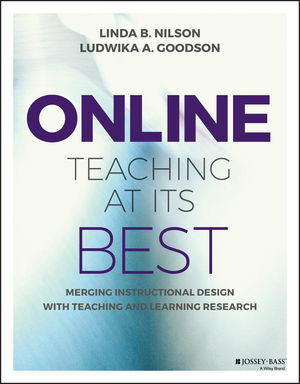 LINDA B. NILSON is director emerita of the Office of Teaching Effectiveness and Innovation (OTEI) at Clemson University and author of Teaching at Its Best: A Research-Based Resource for College Instructors (Jossey-Bass), now in its fourth edition. LUDWIKA A. GOODSON is Associate Director for Faculty Development at the Center for the Enhancement of Learning and Teaching at Purdue University Fort Wayne.